Our intern Nicole Penney is working on organizing the Heritage Foundation of Newfoundland and Labrador's old Registered Heritage Structure files, and came across this gem in the collections from 562-564 Water Street in St. John's. We don't know much about the photo, only that it dates to c1940, and shows Morrissey's shop in the background. In the 1940s a Mr. Morrissey sold provisions and groceries from the store, up until 1969/1970. As for the young gentleman in the car, they are a mystery. Let us know if you have any ideas! Email ich@heritagefoundation.ca if you know anything about the car, or the men in the photo. Read more about the history of the building in the background here. I bet it's not as early as the 1940s. My guess is the mid-1950s. Hairstyles seem to be mid-1950s. The use of "kid" (around well before the 1950s) was popularised in that decade by popular songs etc. Dale, why don't you try the Facebook group "You know you grew up in St. John's Newfoundland if. 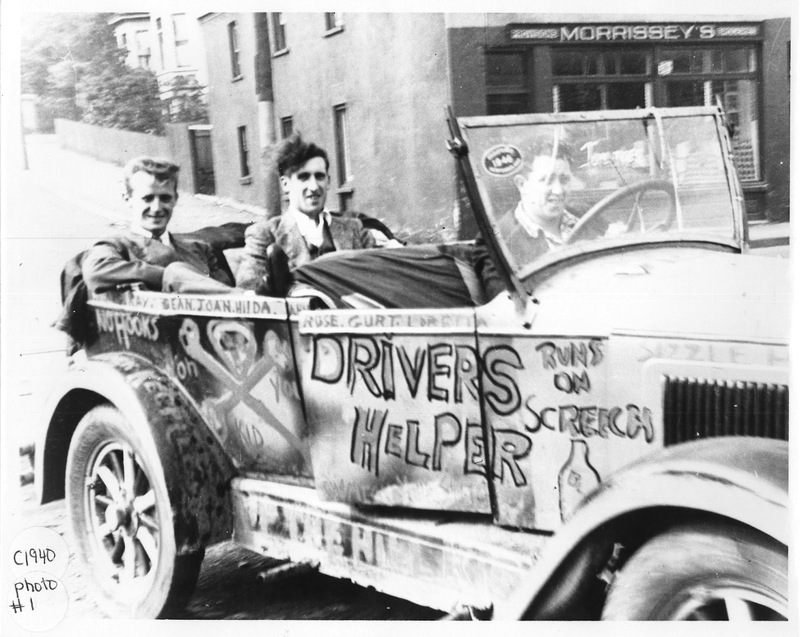 . ." They have lots of old photos and people who may have seen this car! Good Luck - quite the paint job on the car!!! There is actually a sticker on the windshield that reads either 1946 or 1948. You're right, this is the most awesome heritage photo I've seen. Nice paint job. I'm fascinated with these vintage cars, probably because the windscreens have no support and they look like they're gonna fall off - but they don't. If I could only find one the still works perfectly, I'll probably spend my life savings on it. It looks like the ladies played a role in the painting - notice the names along the doors - probably someones aunts or moms today - Kay, Jean, Joan Hilda, Rose, Gurt, Loretta. Girlfriends of the time I suppose. Bet they (or most of them) are still around.